As Solidarity goes to press, the whereabouts of 153 Tamil asylum seekers is still unknown—except that they are on a Customs ship in the custody of the Australian government, probably still on the high seas in the Indian Ocean. After days of Scott Morrison and Tony Abbott insisting they would reveal nothing about the fate of the 153 Tamils, action in the High Court blew a massive hole in the secrecy that Scott Morrison has farcically used to surround so-called “on-water matters”. Operation Sovereign Borders also suffered a major blow when the government quickly backed down and gave an undertaking that there would be no move to remove the asylum seekers to Sri Lanka without giving the asylum seekers’ lawyers 72 hours notice. The government also admitted that they had intercepted the boat outside Australia’s migration zone and that the 153 asylum seekers were still outside the migration zone. However, the government insisted that it did have the right (under the Maritime Powers Act 2013) to intercept the boat and to take the passengers anywhere it liked, except Sri Lanka. But the 153 cannot be taken to Nauru or Manus Island. Because the asylum seekers have not entered the migration zone, they are not (yet) “offshore entry persons” and therefore they are not subject to the government’s offshore processing regime. Abbott and Morrison are desperate to prevent any boat successfully arriving in Australia, so the government can continue its boast that it has stopped the boats. Nothing else could so graphically illustrate Abbott’s willingness to use asylum seekers as a political football and to subordinate human rights to his own domestic political agenda. That agenda has driven the government to ever more loudly proclaim its valued friendship with the bloody Sri Lankan regime of Mahinda Rajapaksa. The willingness of the Abbott government to violate human rights drew international attention when the government returned 41 Sri Lankan asylum seekers at the same time as it took the boat of 153 into custody. The 41 had been subjected to enhanced screening interviews by satellite phone on the deck of the Triton. On the basis of such orchestrated interviews, 40 of the 41 were denied the right to make any protection claim and all were returned to Sri Lanka. The four Tamils who had been on board were beaten by the Sri Lankan navy on return and five others remain in prison. However, some of the returned asylum seekers have since told Solidarity that they always intended to travel to New Zealand and never asked Australia for assistance for the boat, nor for protection. In fact, Australian navy officers had taken over their boat and taken them into Australia’s migration zone. Both asylum boats were essentially hijacked on the high seas. The High Court case will now deal with the question of exactly what powers the Maritime Powers Act gives to the government to capture and hold asylum seekers on the high seas—a process that could take weeks or even months. Meanwhile 153 asylum seekers are being held in limbo on an Australian Customs ship. Like Reza Berati’s killing on Manus Island, this episode has revealed something of the scale of human rights abuses the government is willing to inflict on people who need asylum. 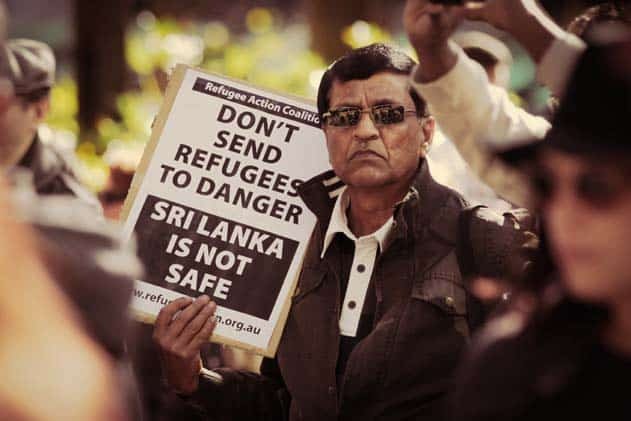 Scott Morrison and Labor’s Bob Carr may claim all the boat arrivals are economic refugees, but the thousands of Tamils who have already been granted refugee visas show that Tamils are facing very real persecution in Sri Lanka. It has opened up another crack in the facade of Operation Sovereign Borders. It can be a real blow to a government that is already on the slide and which increasingly resorts to playing the “refugee card” to maintain any electoral popularity. Snap protests calling for Morrison to “bring back the boat” have been well attended. The campaign will need to make sure that the boat is not forgotten, nor wait for the High Court to decide the fate of the 153 asylum seekers imprisoned on the Oceanic Protector. Major contingents for the anti-Abbott “March in August” protests can keep the pressure on and maintain the momentum of the refugee campaign. Melbourne and Sydney have plans for major refugee rallies in September and October respectively.